"This is a great recipe for a hearty soup. You can substitute tame turkey for wild turkey and still call it wild turkey gumbo because of the wild rice. You can add more kick by increasing the spices or less kick by decreasing them." Place wild rice in a bowl and pour in enough water to cover; soak 4 hours to overnight. Drain rice. Mix wild rice and 1 teaspoon salt together in a stockpot and add about 3 cups chicken broth. Bring broth to a boil, reduce heat to medium-low, cover stockpot, and simmer until rice is tender, about 30 to 40 minutes. Heat coconut oil in a large skillet over medium heat. Cook and stir turkey, onion, carrots, and celery in the hot oil until turkey is cooked through and vegetables are slightly tender, 10 to 15 minutes. Add okra to turkey mixture and cook until okra is thawed, 5 to 7 minutes; season with 1 teaspoon salt, white pepper, and black pepper. 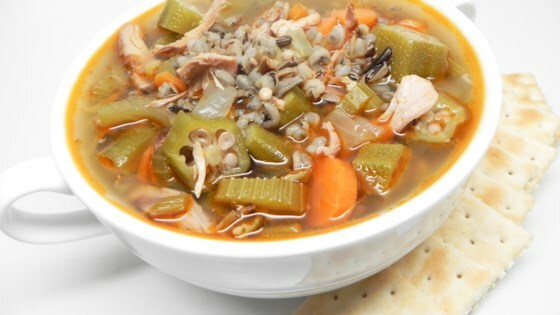 Combine wild rice, turkey mixture, jalapeno peppers, hot sauce, and remaining chicken stock in a slow cooker. I cooked rice in rice cooker while I was stir-frying the vegetables.